Dental disease affects almost every human being, our bodies can not cure it by itself and can not be cured with drugs alone. Most dental disease damage is irreversible and will worsen without treatment and even with treatment it could reoccur. Sometimes a dental condition will compound another or interrelate with it. Because most people do not relate dental disease to their general health or well being, and in occasions its appearance is not dramatic, coupled with their fear of treatment and its cost, many persons will postpone their visits to the dental office until they are in pain or it is to late to prevent more damage. Our mouth performs not only the essential function of speech (been therefore our principal way of communication with the world around us) but it is the center for taste, mastication and the beginning of digestive function. It conveys personality and emotional expression becoming an important part of our appearance. For all these reasons each individual should have an oral hygiene based on a daily, effective dental plaque control program through flossing, brushing and rinsing, good nutrition and stress management. An educated, motivated and responsible patient is the best health care provider he or she can have. Remember "Any treatment can be compared with the benefit of not needing any treatment at all". 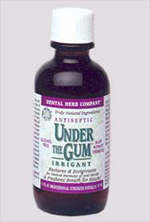 continues to work for a very long time for both periodontal health and bad breath. Applied between the teeth with an inter dental brush, such as a Sulcabrush ®. Applied under the gums using a hand-held syringe with an irrigating tip. 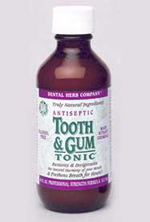 * Ask your dentist or hygienist if either of these additional ways of using Tonic is indicated for you. 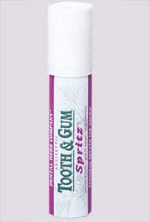 Antiseptic Tooth and Gum Spritz is far more than just a commercial "breath spray." potency. It clings to the tissues much longer than any commercial "breath spray." and people who get close to other people. Available in a .7 fl. oz (21 ML) non-aerosol dispenser. 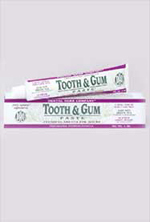 healthy teeth and gums, and freshen breath for hours. Dental Herb Company ® oral hygiene program. recommended use by your dental professional). * No artificial sweeteners or chemical preservatives. This potent formula is designed to be used in an oral irrigator such as a WaterPik®. of ingredients as the Tonic. *Available in a 4.1 oz. amber glass bottle.